cement) to fluid (as many as 10 gallons of water per sack of cement), depending upon the nature of the grouting job at hand. When bagged cement is used, the field mix proportions are usually given in terms of designated amounts of fine and coarse aggregate per bag (or per 94 pounds) of cement. The amount of material that is mixed at a time is called a batch. The size of a batch is usual] y designated by the number of bags of cement it contains, such as a four-bag batch, a six-bag batch, and so forth. The process of weighing out or measuring out the ingredients for a batch of concrete is called batching. When mixing is to be done by hand, the size of the batch depends upon the number of persons available to turn it with hand tools. When mixing is to be done by machine, the size of the batch depends upon the rated capacity of the mixer. The rated capacity of a mixer is given in terms of cubic feet of mixed concrete, not of dry ingredients. plant, stone is crushed into various particle sizes, which are then screened into separate piles. In a screening plant, the aggregate in its natural state is screened by sizes into separate piles. The batch plant, which is usually portable and can be taken apart and moved from site to site, is generally set up adjacent to the pile of screened aggregate. 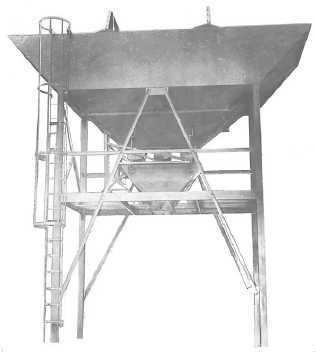 The plant may include separate hoppers for several sizes of fine and coarse aggregates, or only one hopper for fine aggregate and another for coarse aggregate. It may have one or more divided hoppers, each containing two or more separate compartments for different sizes of aggregates. Each storage hopper or storage hopper compartment can be discharged into a weigh box, which can, in turn, be discharged into a mixer or a batch truck. When a specific weight of aggregate is called for, the operator sets the weight on a beam scale. The operator then opens the discharge chute on the storage hopper. When the desired weight is reached in the weigh box, the scale beam rises and the operator closes the storage hopper discharge chute. The operator then opens the weigh box discharge chute, and the aggregate discharges into the mixer or batch truck. Batch plant aggregate storage hoppers are usually loaded with clamshell- equipped cranes. All personnel working in the batch plant area should wear hard hats at all times. While persons are working in conveyor line areas, the switches and controls should be secured and tagged so that no one can engage them until all personnel are clear. When hoppers are being loaded, personnel should stay away from the area of falling aggregate. The scale operator should be the only person on the scale platform during batching operations. Housekeeping of the charging area is important. Personnel should do everything possible to keep the area clean and free of spoiled material or overflow. Debris in aggregate causes much of the damage to conveyors. Keep the material clean at all times.